Establishment politicians and the media are desperately trying to re-write the real history of the radical struggle that brought about this change because they fear that people will take confidence from it and realise they can organise powerful mass struggles on all the key issues and and against the whole capitalist system itself, which is founded on the principle of inequality. Socialist Party member and Solidarity TD Ruth Coppinger, a key leading force in this struggle, was also consciously excluded from the national media during the campaign itself. So this article, written by members of the Socialist Party attempts to put the record straight. Socialist Party, alongside other activists, played a vital role in ROSA’s national Yes campaign- #Time4Choice- which had a big impact. We were also part of the broad Together4Yes group. The yes vote was very strong in urban areas. Most cities had a yes vote of just below or just above 70%. Dublin had nine in the top ten yes constituencies and Wicklow at 74.26% was the other. The overall yes percentage in Dublin was 75.5%. In Stoneybatter, which is made up of working class communities, as well as a new younger demographic moving into the area, the vote was reportedly 92%. 65% of men and 70% of women who voted, voted yes. Overall, 87% of under 25-year-olds who voted, voted yes, and 90% of young women. Young women have been the driving force behind this movement over the last years and particularly in the culmination of the referendum campaign itself. The number of young women who voted in the referendum compared to the last general election in 2016 increased by a massive 94%. Trans young people and school students were also to the forefront and GCN estimated that 91% of the LGBTQ community who voted, voted yes. The attitude of young women growing up in the noughties, with the backdrop of the Celtic Tiger, was not to accept the status quo. That was not the mood or attitude of young women growing up in the noughties, with the backdrop of the Celtic Tiger. 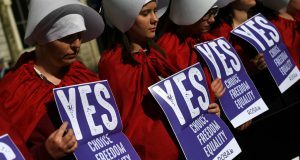 Then there was a growing demand for women’s rights and equality and for a modern secular state, and that meant bodily autonomy and abortion rights. Since then, young women have been a key dynamic pushing Irish society forward. There was huge anger at Savita’s death and tens of thousands of young people, particularly young women, mobilised to demand change. The general position of many longstanding and prominent campaigners in the pro-choice and abortion rights movement at the time was to demand that the ruling in the X Case should be legislated for, to help formalise and clarify what was permitted within the 8th Amendment. 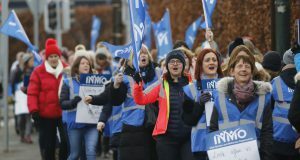 The Socialist Party, particularly through councillor Ruth Coppinger, took a different position saying that immediate repeal of the 8th Amendment was necessary to be quickly followed by legislation that provided for abortion rights. These ideas got a very strong response from the young women mobilised into action by Savita’s death. Leading activists in the Socialist Party and others established ROSA as a socialist feminist platform in the developing movement, of course with a particular focus on repeal and abortion. By 2014 it was becoming accepted in the broad movement that the 8th Amendment needed to be immediately repealed. The impetus for this was boosted significantly when Ruth Coppinger won the By-Election in Dublin West in May after being elected by as a Socialist Party TD and entered the Dáil. Ruth on behalf of the Anti Austerity Alliance (the forerunner of Solidarity) and TDs Mick Barry and Paul Murphy, put forward bills regarding abortion, repeal and on cases of fatal foetal abnormalities. This created new pressure on the government. Their response was the proposal from the Government to establish a Citizen’s Assembly that would be tasked with coming up with proposals regarding abortion. Knowing it was going to be a battleground where, as one journalist put it, the job of the committee “is essentially to water down these proposals to the point that they’re not politically toxic”, as a member of the committee Ruth Coppinger, representing Solidarity, focused on maximising pressure for the acceptance of the 12 weeks on request proposal. If the committee could be pressurised into accepting this, that would cater for 92% of crisis pregnancies affecting people in the south. The Oireachtas Committee met last Autumn and issued its final report just before Christmas. In a major victory for the relentless pressure emanating from the movement of young women, which had been given particular focus by Ruth Coppinger, on behalf of Solidarity, the committee backed up the abortion on request up to 12 weeks proposal from the Citizen’s Assembly. 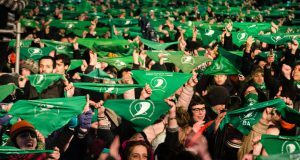 Since 2014 ROSA, the socialist feminist movement, has engaged in a series of extremely high-profile actions that created awareness of abortion pills, which are illegal in Ireland but entirely safe and can be self-administered. These included an abortion pill train and buses travelling the country. By the time the Oireachtas Committee was deliberating the latest figures showed that 10 people from Ireland were travelling abroad for abortions each day and 5 were taking abortion pills in Ireland. This meant that, more so than ever before, abortion was a reality in Ireland, with the likelihood that use of abortion pills would increase further. The evidence shows that ROSA’s actions were essential to the increased usage of abortion pills. The Committee could have proposed a limited form of abortion, less than 12 weeks, but with the increasing use of abortion pills such a law would have been immediately unworkable and outdated. Abortion pills meant abortion up to 12 weeks was already an established fact in Ireland, clearly the majority on the Oireachtas Committee felt that they could safely now row in behind that proposal. A few days later, ROSA launched its last batch of posters. 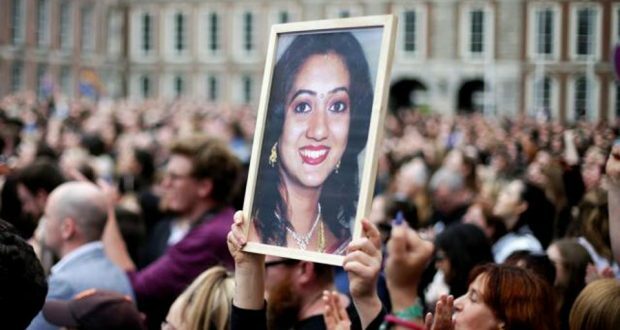 One, which featured a large photo of Savita with the simple message “Savita Matters – Women Matter – Vote Yes”, went up in all the main city centres and throughout the whole of Dublin. Up until then Savita and her image had been absent from the campaign. These posters acted as a deliverance for people, a long overdue “strike back.” They reminded people generally of the reality of what the 8th Amendment meant; but they also helped to give confidence to many others to get active, either in the different campaigns or as individual advocates for Yes right up to polling day. Socialist Party members were very active, along with others, in ROSA’s and Solidarity’s campaigns, as well as in the broad Together4Yes Campaign. ROSA and Solidarity were very active in communities but were, in particular, a real feature in city centres. We were very active in all the communities where we had branches and activists. Very strong campaigns were waged in areas where our members were councillors and by TDs, Paul Murphy, Mick Barry and Ruth Coppinger in Dublin South West, Cork North Central and Dublin West respectively. ROSA’s campaign was a real feature and pronounced in city centres. ROSA’s campaign started with the brilliant 500-strong national rally in Liberty Hall, Dublin on 14 April and included daily actions, as well as sponsored walks to the airports in Cork and Dublin attended by 350. These walks were retracing the steps of the thousands and thousands who have been forced abroad for abortions over the last 35 years. On the day of the count 250 attended a ROSA rally in the Projects Arts Centre in Dublin and hundreds of people were signed up to ROSA.